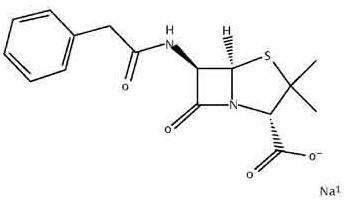 Penicillin G is a β-lactam antibiotic produced by the Penicillium fungus. It has shown efficacy against a variety of Streptococcus species as well as non-penicillinase producing Staphylococcus species. Penicillins are a type of β-lactam antibiotic consisting of a four-membered β-lactam ring bound to a five-membered thiazolidine ring. This two-ring system causes distortion of the β-lactam amide bond, resulting in decreased resonance stabilization and increased reactivity. β-lactams inhibit the formation of peptidoglycan cross-links within bacterial cell walls by targeting penicillin-binding proteins or PBPs. Consequently, the bacterial cell wall becomes weak and cytolysis occurs. Resistance to β-lactam antibiotics occurs in the presence of cells containing plasmid encoded extended spectrum β-lactamases or ESBLs.